Downtime just became more fashionable and fun. 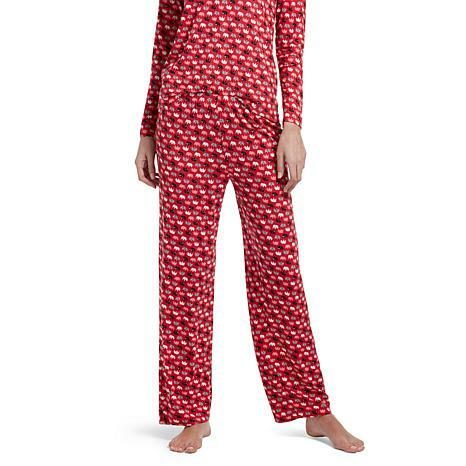 This lightweight, cozy pajama set makes the perfect upgrade to your loungewear collection. The festive prints are exciting and eye-catching. Be sure to grab two sets — one for you and the other for a gift! Fit: Top - Close-Fitted: Designed with no more than 2" of ease between body and garment. Measures 2" larger (at most) than the fit-critical body measurement. Follows your curves, outlining your figure. ; Pant - Fitted: Designed for 2 to 3 inches of ease between body and garment. Measures 2" - 3" larger than the fit-critical body measurement. Slightly more relaxed than a close fit, still outlines figure but not tightly. Catch some stylish zzz's. Lounging around the house just got a super-comfy makeover with Maidenform's double-brushed jersey knit pajama set. The button-down, lace-trimmed top and pull-on pants add luxurious comfort and serious style to your relaxation time.